This is a quick “cookie” and a crowd pleaser. It is a good one for gift giving because it is so delicious and so quick to make. It also packs and travels well because of the casual “cookie” shape and no frosting. Mix together butter, vanilla and salt. Gradually add sugar and then mix in the flour. Stir in the chocolate chips. The mixture is quite stiff. Press into a non-greased 15x10 inch pan. Bake at 350° for 20-25 minutes to a medium golden brown, just like a chocolate chip cookie. Cool slightly and flip pan to release baked cookie onto a bread board. When completely cool, break into irregular pieces. 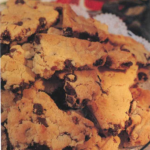 I was going to make your cookie brittle and you mentioned that the recipe was in your Christmas Cottage book. I have that book and looked up the recipe and noticed that that it said 1 cup sugar, 2 cups flour. In your blog here, it says a different amount of sugar. I’m sure that the recipe here is correct, but I thought I would just double check with you……and you are using white sugar? Again, just double checking. Your photo of the cookie brittle looks so good, my grandchildren will love it!! Ps: your Christmas Cottage book is so lovely, I spend one evening just before Christmas looking at it. Do you still own that house? It’s gorgeous inside and out! I am sorry Kathy…the book is right. I think it was the sugar amount that was wrong. It is such a simple recipe, I can’t believe I messed it up. I think we corrected it the first day, but perhaps that didn’t work either. I don’t still own that cute little house, but I see it everyday in my neighborhood…it was a charmer. 1 cup sugar. Sorry, thought I had proofed carefully. Can I blame it on the holiday rush? It has now been corrected on the site. The sugar is missing from the Cookie Brittle ingredients list. Looks like a scrumptious recipe, and I’d like to try it! You need 1 cup. Sorry. I always think I have proofed thoroughly. There is no measurement for the sugar. You need 1 cup sugar. The recipe should now be corrected on the site. So sorry.